With notifications you can be notified when your Qwilr Pages are viewed, the first time or every time. If you're an admin you can also be notified of the views for all of your team. You'll also receive a notification once all parties have accepted your page. By default, we'll email you the first time your Qwilr Page has been viewed. The notifications are only sent to the creator of the page. You can change these defaults in your account by heading to the settings page at Settings → Notifications. If you're an account admin you can also opt to receive notifications for all users in your account or only for your own Qwilr Pages. 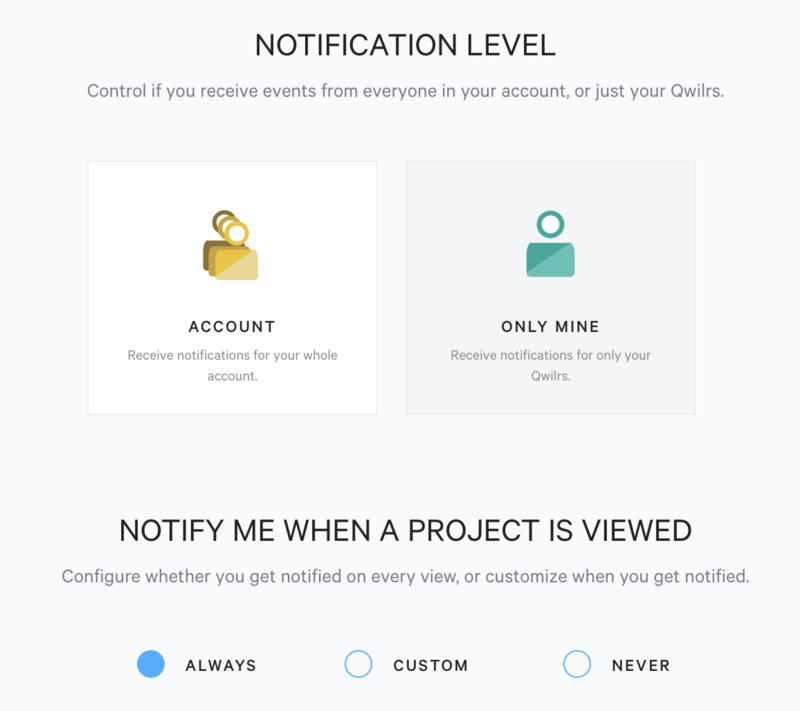 All users can decide how often they want to be notified. You can be notified for every view or only for a custom number of views (the first 3 views for example) or turn off notifications all together. We'll automatically send an email notification when all parties have accepted your Pages. This means if you have multiple acceptors the emails will only be sent once everyone has signed. Your clients also receive an email once everyone has signed along with a PDF copy of the signed proposal. While Qwilr only sends email notifications on views or acceptance, you can use our various integrations to receive notifications via other mediums. For example, if you use Slack, you can activate the Slack integration to receive a message in a #channel of your choice whenever views happen. Or you can use our Zapier integration to send notifications to any of the 1000+ apps they support.